The clinical benefits of gadolinium-based contrast agents when used for brain MR imaging are significant, and they include the ability to see more lesions and improve lesion characterization. Several different GBCAs are available, with the newest entrant, gadoterate meglumine — Dotarem®— having become available in the U.S. in 2013. GBCAs can be classified by clinical use as extracellular fluid space, liver-specific, or blood pool. The agents’ characteristics also include linear or macrocyclic chelate structure, nonionic or ionic bonding, and varying levels of stability. GBCAs share a 90-minute half-life and are predominantly if not completely excreted in the urine. Because extracellular fluid space agents are used for neuroimaging, they will be the focus of this article. Gadolinium-based contrast agents have been used around the world for about 20 years and are very safe and well tolerated. Reported adverse reactions of any type in the acute setting are typically less than 3%, and limited to nausea, emesis, headaches, occasional vomiting and the rare case of hives after injection. Serious adverse reactions are significantly less common than those caused by the iodinated agents used in CT scans. All agents release some free gadolinium, a toxic heavy metal, and none are entirely free of the risk of nephrogenic systemic fibrosis (NSF). 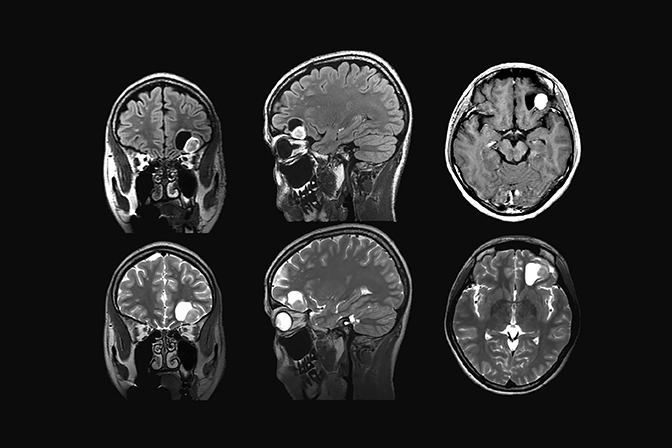 Magnetic resonance imaging is used routinely to image suspected cerebellopontine angle lesions, most commonly in the evaluation of patients with hearing loss and dizziness. Contrast-enhanced, T1-weighted and bright fluid/cisternographic imaging are integral to dedicated imaging protocols for imaging of neoplastic disease (Figures 1 and 2). Imaging can be of benefit for patients with atypical cases of Bell’s palsy. Unexpected masses, or as in the case of sarcoid-related Bell’s palsy, nerve inflammation, can also be revealed (Figures 3 and 4). 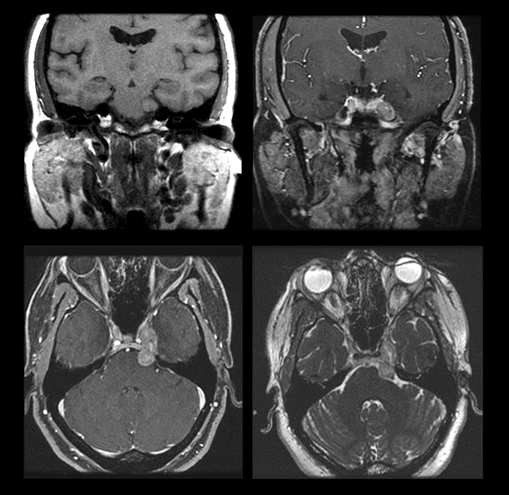 Contrast agents assist in the routine MR imaging of suspected pituitary lesions by highlighting the difference in appearance of the rapidly and floridly enhancing gland and the slower and less avidly enhancing lesion. 3D imaging protocols can assist in visualizing very small lesions. Typical 2.5 mm or 3 mm slices volume average more normal tissue than the thinner slices (approximately 1 mm) of a 3D study. Recently available 3D fast spin echo acquisitions overcome the limitations of older techniques and should be considered for routine use. While perhaps less beneficial for the evaluation of macroadenomas, contrast is commonly used and may improve delineation of lesion borders with the adjacent optic apparatus and the presence of cavernous sinus invasion. Contrast enhancement is an essential part of routine MR imaging protocols in patients with suspected metastatic disease, offering improved sensitivity especially with tiny nodular metastatic lesions which may elude detection without the use of contrast. 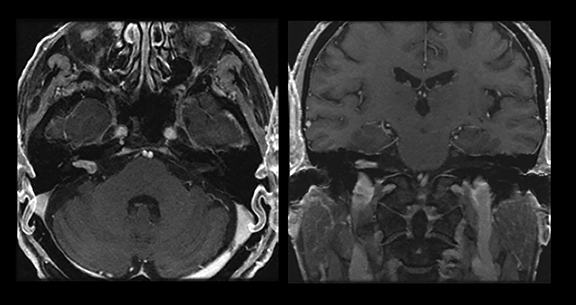 Leptomeningeal involvement is difficult to detect in on an unenhanced MR exam. Using contrast for this application improves sensitivity (Figures 5 and 6). Postcontrast, 3-dimensional, T1-weighted techniques provide thin slices, which improve disease detection and the enhanced efficiency of three planes in a single scan. Perfusion imaging is an off-label use of contrast-enhanced MRI that can assist in characterizing primary brain tumors and can be essential in differentiating treatment related changes from tumor. There are many versions of commercially available software which analyze data from the first pass of the contrast agent through the brain and deliver parametric images of blood flow and blood volume. Certain lesions, such as pilocytic astrocytoma, have characteristic features that facilitate diagnosis (Figure 7). Permeability imaging — based on tracking lesion enhancement over the first few minutes after injection is also beneficial. Hemangioblastoma, as an example, reveals the characteristic enhancement signature of angiogenesis — prompt and impressive early enhancement and plateau or washout delayed enhancement kinetics. Lymphoma typically has a less striking permeability signature than glioblastoma or metastasis, both of which may mimic its appearance with routine techniques. The combination of perfusion and permeability imaging can also help differentiate treatment-related enhancement from recurrent tumor. In one patient with known glioblastoma, perfusion imaging was of profound and critical importance in characterizing the enhancement on the images as reflecting tumor progression or treatment-response-related pseudo-progression. The patient, who was receiving combined radiation therapy and chemotherapy, had a scan which revealed the presence of a large enhancing lesion. Pseudo-progression, although somewhat sinister in appearance on imaging, actually represents a positive response to treatment, and must be recognized to avoid unnecessary alterations in treatment regimen. Since the patient was clinically well, the treating team assumed that imaging was reflecting these treatment related changes. Advanced imaging proved this not to be the case. Biopsies around the enhanced rim confirmed the malignancy, and additional surgery was performed. The combination of perfusion imaging and spectroscopy can help characterize masses which have a nonspecific appearance on routine imaging, such as differentiating tumor from abscess and demyelination. Infection and demyelination have a much less impressive signature than tumor with respect to blood volume, blood flow, and permeability. Restricted diffusion is frequently seen in demyelinating lesions, particularly at the periphery of rim-enhancing lesions. 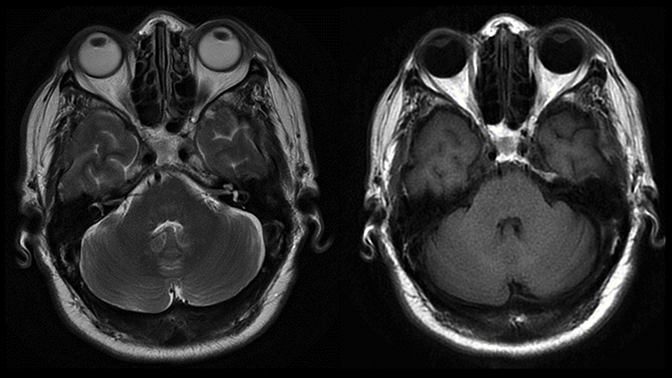 Restricted diffusion in the center is virtually pathognomonic of an abscess lesion although not always present. Diffusion may detect recurrence of infection better than other imaging techniques. Spectroscopy can reveal characterize metabolites that differentiate infection from tumor. Specific resonances from the byproduct of anaerobic glycolysis, such as an amino acids, alanine, acetate and succinate may be present that can identify an abscess. The spectroscopic signature of tumor is elevation of choline peak and elevated ratio of choline to NAA (the marker of normal neural tissue). Unfortunately, many abscesses fail to reveal these characteristic metabolites, and any lesion with robust tissue turnover can mimic tumor on spectroscopy. Permeability is also a differentiator, because it reflects angiogenesis, which is not associated with demyelinating disease and infection. Multimodal assessment of lesions with the previously described techniques can be critical in weighting the differential diagnosis. In general, less impressive values favor lesions such as tumefactive demyelination and abscess more impressive values favor tumor. Contrast agents are commonly used for patients with inflammatory diseases like multiple sclerosis. 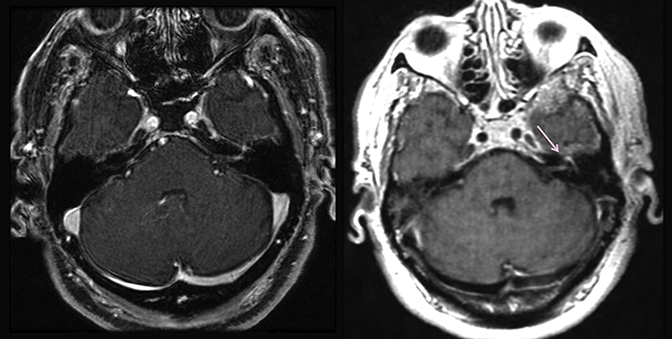 Enhancement is the typical imaging marker of an active lesion. At our institution, 3D fast or turbo spin echo (CUBE or SPACE) FLAIR techniques are part of the routine assessment of MS. This volumetric acquisition offers thin slices (1.5 mm), which improve sensitivity, as well as 3-mm slices in all three planes in a single efficient acquisition. Performing FLAIR immediately after (instead of before) contrast administration in advance of the T1-weighted images provides a “free” delay, known to improve visualization of blood brain barrier breakdown. Diffusion imaging can assist in the diagnosis of infection in the spine, offering improved sensitivity and characterization. Diffusion imaging can also be helpful in the detection of spine tumor; assisting in determining whether an intraspinal mass is intramedullary or outside the spinal cord. 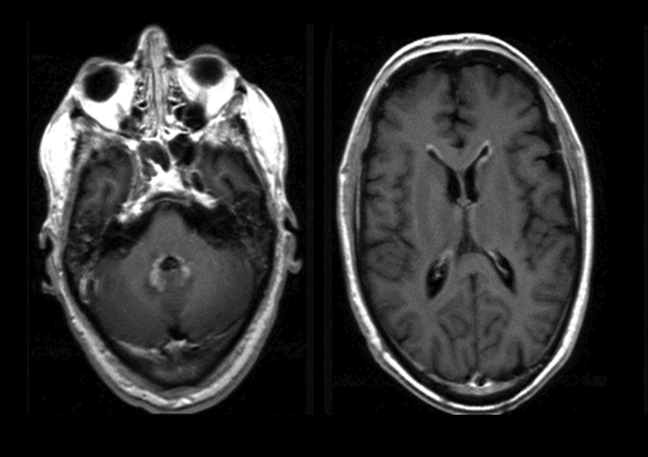 Newer diffusion imaging techniques such as restricted field of view (FOCUS) or Multishot EPI (RESOLVE) produce superior image quality, which should increase utilization of this powerful mode of MRI. Because of the abundance of fat signal in and about the spine, suppression of fat signal can assist in visualization of enhancement. This can be quite challenging in the spine, especially with some body shapes or in regions with large changes in habitus, such as the brachial plexus or the cervicothoracic junction. “Failed” suppression actually represents a shift to water suppression, as exhibited by the complete loss of visibility of the spinal cord and will mask enhancement. Shifting from RF-based fat suppression to fat-water separation (FWS) water only imaging (exciting only water and thus leaving the fat without the ability to generate signal) provides uniform fat suppression as well as excellent lesion depiction. Among the benefits of the FWS method is that four image contrasts can be acquired in the same acquisition: a fat-suppressed scan, a non-fat-suppressed scan, a fat-only image and a contrast-enhanced out-of-phase image. Contrast techniques facilitate evaluation of metastatic disease in and about the spine. Contrast agents play a powerful role in the imaging evaluation of diseases of the head and spine. Using routine techniques, sensitivity and characterization are boosted. Leveraging advanced, contrast-based techniques such as perfusion and permeability imaging, more definitive differentiation of treatment-related changes from disease can be achieved. 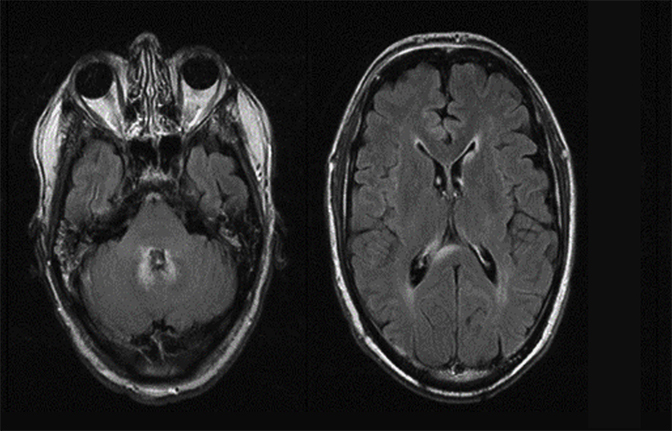 Contrast-enhanced neuro MRI: Issues and indications. Appl Radiol.